VÁŽENÉ A MILÉ DÁMY, JE TU TÉMĚŘ JARO, UŽ JE CÍTIT VE VZDUCHU, A S NÍM PŘICHÁZÍ I ČAS, PŘIPOMENOUT SI, ŽE JE NA ČASE VĚNOVAT SE SAMI SOBĚ. DOPŘEJME SI A TROŠKU SE ROZMAZLUJME, ABYCHOM ROZKVETLY JAKO KVĚTY Z JARA. SEJDEME SE " NA KOPEČKU " V SOBOTU 9. 3. 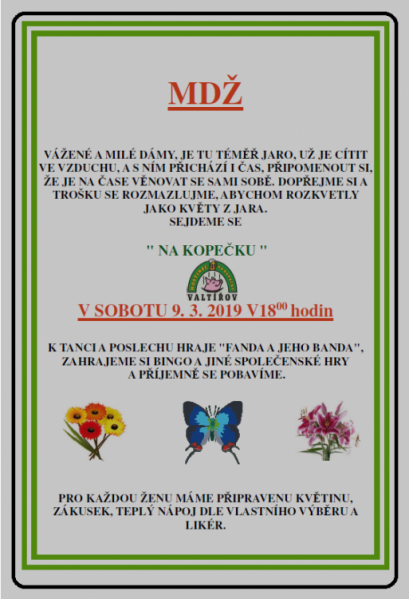 2019 V 18.00 hodin K TANCI A POSLECHU HRAJE "FANDA A JEHO BANDA", ZAHRAJEME SI BINGO A JINÉ SPOLEČENSKÉ HRY A PŘÍJEMNĚ SE POBAVÍME.